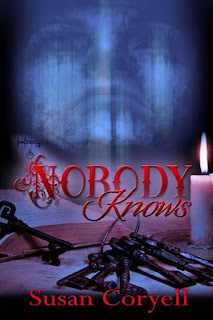 Artist, Debbie Taylor, has completed the cover for NOBODY KNOWS. Getting various responses from friends and readers far and wide--everything from, "Yikes!" to "Love it!" I find it eye-catching and hope it is in no way off-putting. I do write ghost stories, you know! As one follower wrote on Facebook: "Now there's a face to your ghost!" NOBODY KNOWS is the third novel in the Overhome Trilogy--cozy mystery/Southern Gothics with contemporary characters and setting and a history background--primarily Civil War. No release date yet, but I am hoping for early summer. The Wild Rose Press has published all three of the Overhome books, including: A RED, RED ROSE and BENEATH THE STONES.